Receiving a letter, email or phone call to hear good news of a grant award is exciting for nonprofit representatives. But, three charities recently enjoyed an even bigger thrill when board members from the H.N. and Frances C. Berger Foundation arrived with balloons, an oversized cardboard check, and the real thing – a grant check for $10,000! “We had no idea,” said Patricia Korzec, Executive Director of the Coachella Valley History Museum. “It was a wonderful surprise,” said Chet Hecht, Outreach Director for St. Margaret’s Episcopal Church. “I am still in shock and so grateful that the Berger Foundation selected us,” said Terry Cechin, President of the Desi Strong Foundation. All three recipients were surprised on different days while CBS Local 2 live streamed the grant presentation on its Facebook page. Prior to the presentations, CBS Local 2 Reporter Alexandra Pierce, set the scene by scheduling what appeared to be a standard television interview with each of them about their organizations. As the CBS Local 2 cameras rolled, Christopher McGuire, Vice President of Programs of the Berger Foundation, and Catharine Reed, Program Director of the Berger Foundation, stopped each of the interviews cold by flashing a $10,000 grant check as they walked through the doors. Later each evening, Pierce’s stories aired on CBS Local 2’s Eye on the Desert program. 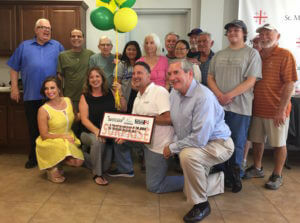 Not only were the stories about the surprise grants, but each also provided an overview about the organization and how the funding will benefit Coachella Valley residents. 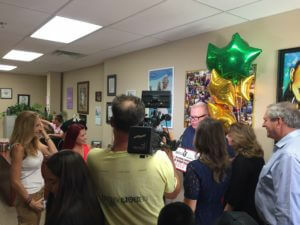 The surprise grants were an offshoot of a nine-year partnership between the H.N. and Frances C. Berger Foundation and CBS Local 2, where each month, a local nonprofit receives a $25,000 grant. But these three gifts were in addition to the monthly awards. The grants were unknown and unannounced. In fact, each of the three surprised benefactors had received a notice last December that their organization had not been selected as a 2017 Coachella Valley Spotlight recipient. Therefore, receiving anything from the foundation was a complete turn of events. Since the end of 2008, the Coachella Valley Spotlight program has awarded more than $2.25 million to more than 90 nonprofit organizations serving local residents. 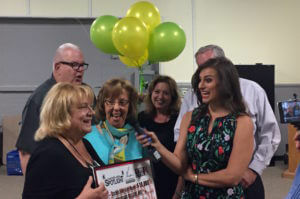 The surprise grants were presented during the same timeframe as the latest call for Coachella Valley Spotlight applications, which will be awarded in 2018. “The CBS Local 2 Advisory Board has a tough decision to choose only 12 nonprofits out of about 100 applications,” said Reed. “The surprise grant idea came about because we wanted to support additional organizations through this partnership.” The Desi Strong Foundation will use its $10,000 to help local families with children battling cancer pay for ancillary costs such as travel expenses for out-of-area treatment. The Coachella Valley History Museum plans to use the grant funds to improve its junior historian and after school art programs with the purchase of electronic tablets, tables, chairs and art supplies. St. Margaret’s Episcopal Church will use the $10,000 surprise grant to purchase refrigerators and freezers for its Neighbors 4 Neighbors food distribution program. For more information about the Coachella Valley Spotlight, visit cbslocal2.com, and click on the Coachella Valley Spotlight logo near the bottom of the home page. To learn more about the Desi Strong Foundation visit www.desistrong.org or call 760- 679-DESI. For more about the Coachella Valley History Museum go to www.cvhm.org or call 760-342-6651. And, for more information about St. Margaret’s Episcopal Church and its Neighbors 4 Neighbors program, visit www.stmargarets.org or call 760-346-2697.